Every vastu symbols brings a certain kind of luck. It is important to place them correctly. 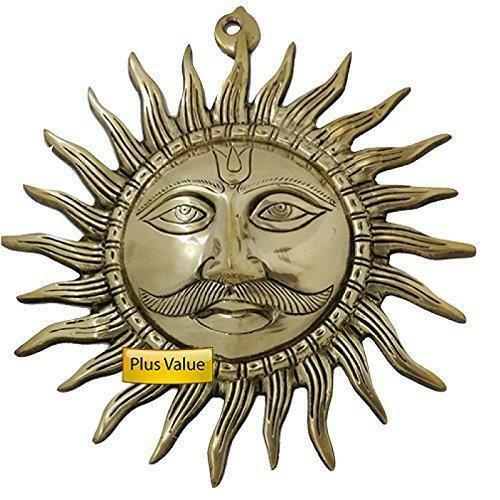 A sum made in brass is excellent vastu harmonizer when placed on east wall of the home. If your house or working place does not have window towards the east , a sun can be placed as a virtual symbol. A toilet, heavy storage or a staircase in the toilet obstructs the cosmic forces of sun. A sun on the east wall is a simple solution. The sun plays the most paramount role for all living species on planet, without the sun there would be no existence of life on Earth. Humans, animals and plants on Earth need the sun because it provides most of the energy required to survive on the planet. Earth would be a extremely cold and lifeless planet if it did not get its light and heat from the sun. Similarly, the Earth's stays in orbit because of the gravitational pull of the sun. Ancient people have recognized what the Sun can bring to life on Earth. Much more most of them even considered the Sun as god. Plus Value International is a Mumbai (India) based company managed by Jeavin Parmar , CEO. Products are made with finest quality material that enhances their utility value and functionality. Plus Value is catering to the foreign buyers and high-class Indian society, who have deep interest in holisitc science. Our exclusive collection comes from almost every corner of the country. The company's main business is producing & acquiring holisitc products. Crystal crafts as well as our traditional and contemporary wood & metal art designed and carved by Indian artisans in high quality material. The objective of its founders is to revitalize the holistic science and let the world knows it. Based upon the experience and the balance of the taste of clients its founders classically create some own designs in addition to the traditional ones.